Professor of Social Sciences and Economics @ Brown Univ. Last week Justice Antonin Scalia suggested that affirmative action (AA) might be counterproductive, because it encourages black students to attend highly selective colleges whose academic demands these students might not be well prepared to meet. AA might even lessen the likelihood of their successful completion of rigorous programs in the hard sciences. Scalia’s comments, made during an affirmative action case before the US Supreme Court, prompted the recirculation of this editorial cartoon. The cartoon, which I saw on Facebook, is the kind of commentary that makes the liberal cognoscenti chuckle up and down the East Coast. Ha ha. Such supercilious reaction only underscores the intellectual poverty of public discourse about race and inequality in America. Scalia’s speculations, while arguable, are not implausible. Moreover, they can only be effectively rebutted by citing evidence, and not by calling names. 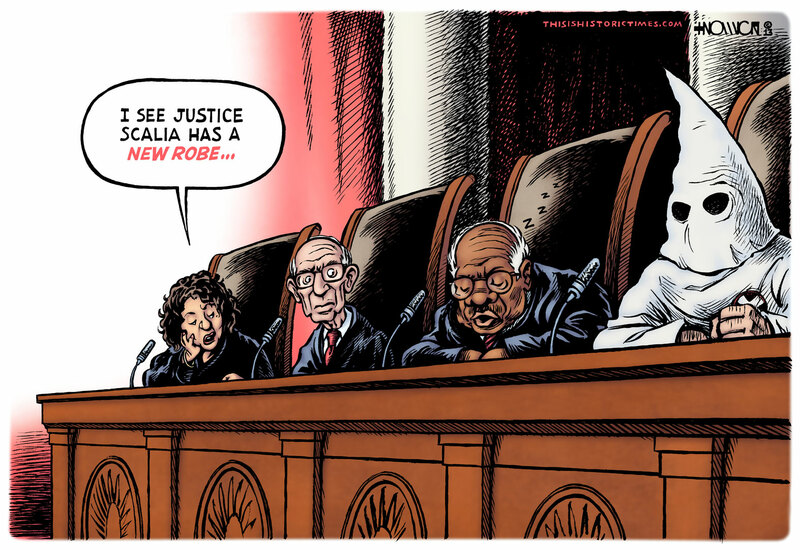 Scalia's questioning was not in the least bit racist. He was (crudely, I acknowledge) referring to the so-called “mismatch hypothesis,” which holds that AA distorts the allocation of black students across competitive colleges, and that distortion adversely affects the college experience of AA's beneficiaries (by leading fewer to major in the sciences, etc.) There is good evidence supporting this view, and it deserves to be taken seriously. These are not ideological issues, but social scientific ones. Scalia was not saying, as he has been accused of implying, that black students are congenitally unsuited to study technical subjects or attend elite schools. Rather, he was postulating that colleges vary in the intensity of the intellectual demands they place on students; and that students vary in the extent of their academic preparations for meeting those demands. One aspect of Scalia’s concern -- supported by the work of scholars such as Peter Arcidiacono at Duke -- is that the net effect of affirmative action may be to leave many black students who are interested in the sciences, and who might have flourished at the less academically demanding colleges, on the academic margins at the more demanding schools. In particular, take note of the passage below, and its quotes from Duke University’s Peter Arcidiacono. Arcidiacono’s careful analysis of the data at his home university showed that the black students -- who on arrival expressed a similar interest to pursue a technical curriculum but who, due to affirmative action, came with lower prior academic qualifications than their non-black peers – were significantly more likely than white or Asian students to abandon their initially expressed intention to major in one of the hard sciences before graduation. “Peter Arcidiacono, a Duke economics professor, was part of the three-person team that co-authored the study. Arcidiacono said he does not think people fully understand its implications. Arcidiacono explained that while it is true that black students are much less likely to persist in certain majors, these differences disappear once the researchers distinguished students based on their academic background. Name-calling is easy, but problem solving is harder. If one is interested in producing genuine racial equality of opportunity for college students in this country, given the facts on the ground, one will necessarily have to come to terms with a vast disparity by race in preparation and qualifications for advanced study in the technical curricula. To paint a conservative jurist like Scalia as a Ku Klux Klansmen is simply to adopt a comforting pose, not to make a serious argument, and it points us nowhere close to a solution. It also shows a scandalous contempt for the institution of the United States Supreme Court. So, enjoy yourselves, liberal cognoscenti. And, while you’re guffawing, you can settle in for a few more decades of black "underrepresentation" in the STEM disciplines at the elite colleges and universities of America. Because name calling is not going to address the underlying developmental inequalities that make affirmative action necessary to achieve a greater black presence at America's elite institutions of higher education. One of the things that makes the UT case interesting to watch, at least from my perspective, is that it's forcing an evaluation of the tangled relationship between race and class in higher education. The UT 10% policy went into effect shortly after my cohort of Texan high schoolers graduated, and at my highly competitive high school - which used to send easily 30% of graduating seniors to UT Austin - the handwringing about unfairness was loud and long. The response to such handwringing was simple, however - students at elite Texas high schools were more than capable, both in terms of preparation for college-level work, financial resources, and cultural competency, of attending other first rate universities besides UT. One could argue that UT's 10% rule (in which any student at any Texas high school who ranks in the top 10% of their graduating class is automatically admitted to UT Austin, the flagship campus) cuts across class lines to create paths to higher education access for any student willing to work hard. In a state only one generation removed from legal segregation, those class lines inevitably break along race lines as well. But one critic noted - maybe it was in the Atlantic - that such a policy effectively passes the buck, and assumes entrenched class and race inequality across public high schools without proposing a solution to it. The statistics on mismatch for students of color who have benefited from AA are compelling, but I don't see why the answer should be that those students should be at lesser schools, as Scalia suggested. Instead elite institutions could do a better job of creating communities of support for those students. Student athletes are regularly given academic support and community structure without anyone thinking twice about it. Doesn't a bright black kid who wants to study biology or a kickass Tejana kid who wants to be a doctor, but whose parents haven't been to college, deserve the same (or better) institutional support as a football player? In order to work, AA can't just be about admission policies. It has to be about deep institutional change. I'm not sure what "academic support" you have in mind, but I'd assume you don't advocate academic support that's available only to minority students -- something that would present another more-difficult Constitutional quandary. Thus, I'm assuming you're talking about generally available academic support. What evidence is there that elite institutions have poor or insufficient academic support? The fact that some students do relatively poorly is inevitable (not everyone can be above average), so that fact proves nothing. More generally, what would be wrong with a school saying, "Here is the standard of learning we expect you to meet. Here are the means of instruction and support that we provide. Most of you will do just fine. If you do not think you can meet our standards given this type of instruction and support, this may not be the place for you." That's why the institutions are considered "elite" to start with. So long as black Americans are admitted to the most elite sites of intellectual development based on a lower objective standard of their own prior academic achievement, we will not be truly equal participants, no matter how loudly we cry out about the legacies of white supremacy. I am interested in true equality. I am uninterested in self-righteous moralizing about a judge's racial etiquette. Can I be the only one disturbed by the specter of other racial minorities taking the lead and dominating the scene at Caltechech and MIT and in Silicon Valley -- based upon their skills, while black Americans are reduced to the position of "competing" by insisting that their presence is required in order to insure "racial diversity"? In some ways, I agree with you. Though I also think it is important to remember why particular minorities (African Americans and Native Americans) make these demands. Tackling this issue takes a ground-up approach. Each academic generation begins at a faster rate of knowledge acquisition than the previous one. Just the same, the public school industry should work to close the gap between communities with each generation. Children living in low income neighborhoods are given old textbooks with chapters missing from them. They have little space and teachers must perform without the supplies that allow the efficiency granted to those belonging to wealthier communities. The public school industry should be standard; this is equality. It has less to do with admitting underqualified students, and more to do with allowing everyone the opportunity and ability to achieve their goals. Even then, not everyone will want to attend a private university but those who choose to apply will not only want it, but be as competitive as they need to be to become worthy of the title you call elite. The entire nation and its marginalized people, including White Americans living in poverty, can benefit from a system like this. I largely agree with Katherine Howe. The underlying assertion implicit in Scalia's remarks as outlined by Professor Loury seems to be that because AA disregards academic preparation, those minority students should be at less elite schools so that they can excel in STEM disciplines. This is not a convincing argument against AA for a few reasons. Start by taking the example of low-income students who excel in their studies at less rigorous, poorly funded public schools in low income areas. Some elite universities with resources are making an effort to attract those students and provide funding for them - in principle a laudable effort with potentially enormous social benefits. The public high schools which those students excelled in may not provide the type of academic preparation for schools like Duke, as in Peter Arcidiacono's study, but their demonstrated work ethic and ability to learn is deemed sufficient by the university admissions board, and the opportunity for upward mobility and one step in the fight against extreme income inequality is well-served. Whether or not these low-income students or racial minorities via AA in elite universities are "forced" away from STEM disciplines, their career prospects and earnings potential is dramatically improved and allowing for the following generation to have ACCESS to the kinds of academic preparation that Scalia's refers to. Finally, as Katherine Howe pointed out, it is the institutional change that AA seeks to trigger - over time by generation, but more importantly with complementary services and support by the Universities (and perhaps in collaboration with the public) to help disadvantaged populations benefit from the most valuable asset this country has - the world's best universities. The original objective's of AA were to support efforts to breakdown the strength of institutional barriers towards racial equality. Those barriers are not as strong as they used to be, but they still exist. Is AA still the best way to support further efforts to break them down today? Perhaps. But Scalia's case seems to avoid the underlying issues, just as the cartoon that Professor Loury shared does. "Both Drolet and Arcidiacono agreed that affirmative action doesn’t change whether or not minority students go to college: It changes where they go to college. And in states where affirmative action policies have been banned, students are more likely to attend universities where they were best prepared to succeed, regardless of ethnicity." - Where a student goes to college determines their social network and job opportunities. Students who attend UC Berkeley Haas School of Business, for instance, have a much higher chance of working in Wall Street than students from San Jose State. In fact, Wall Street firms typically hire exclusively from brand name, selective schools. Hence, it is fair to say that the education system is partly responsible for feeding the social caste, a phenomenon described by Mitchell Stevens's book, Creating a Class: College Admissions and the Education of Elites. - Since SAT scores correlate with zip codes (aka: income levels), there is a clear disadvantage for minority ethnicities from low-income areas to penetrate selective universities. Most of these students simply lacked the resources necessary over the course of their lifetimes to produce the cognitive skills required to perform well on college admissions benchmarks. Hence, the American socioeconomic system perpetuates disparities in the racial demographics of college admission. - Among many other factors, a critical one used in college admissions decisions is a student's potential to withstand course rigor at the college of interest. If selective colleges are pushed into admitting ill-equipped students - from any ethnicity - this will likely end badly for all players, student and college included. Affirmative Action, an artificial compensation method, seems to play a role in this push. Therefore, I consider Scalia's concern a valid one. Though well-intended, Affirmative Action is a weak solution to a bold problem: educational disparities caused by capitalism. The folks running these institutes, making these grants, awarding these Nobels, and editing these journals -- those folks all know the real deal. They will accommodate demands for "diversity" in order to make the fit-throwers go quietly to their corners, and to be free to get on with their real work of discovery, invention and innovation. Affirmative Action is the path of least resistance.. Developing the latent human talents of a disadvantaged and discriminated against population is hard work which they, and (sadly) we, seem eager to avoid. Is this entire issue a direct result of income inequality? While there are certainly many other factors, I am tempted to say economics is the primary one. And if so, what can be done about that? It is fine to say that Justice Scalia's speculations are "not implausible," but Prof. Loury seems too amenable to any anecdotal evidence that gives weight to the "mismatch hypothesis." It is the weight of history that I am more concerned with here, a history that is routinely bypassed or superficially studied by this particular associate justice. Certainly the tone-deaf quality of his periodic pronouncements does not help either. In his selectivity when it comes to intuiting what the founders meant, Scalia displays a kind of wrongheadedness that can only be labeled self-serving: the Heller decision on the Second Amendment comes to mind. He based his opinion on one 19th-century casebook that supported his preconceived bias. Effectively, that is what Prof. Loury does in citing a study conducted by Peter Arcidiacono that seems to give credence to Scalia's invocation of race as a fixed category, while denying class and other factors. Perhaps this is where the disciplines of History (the Humanities) and the Social Sciences are at odds. The Duke sample does not impress me. To assume that most blacks perform less well at highly competitive white-majority schools based on a changing of majors does not mean that those who change their major will not be intellectually fulfilled or succeed in professional life. Social scientists are not able to master the intangibles nor are they immune to inherent biases in the way they frame their questions in studies of people's decisions and motivations. More to the point, Peter Arcidiacono's study finds that the black students at Duke did not lag behind whites in the major they eventually switched to. And, just as important, students admitted to Duke as legacies (children of Duke alumni), who switched from the sciences to the humanities, proved to lag behind the white non-legacies to the same degree that AA students of color did--so this is not really about some fatal flaw in Affirmative Action. We should ask, then, when are colleges going to drop legacies?! Why is only AA for nonwhites a problem and legacy policies not considered a form of "affirmative action"? To double-down on the bias factor, consider this: Prof. Arcidiacono is himself a member of a group called Project SEAPHE, which is waging a war against Affirmative Action in California. He believes, too, that the SAT is an accurate measure of racial differences. Perhaps the best way to put this critique is to remind readers that in the early 20th century, based on IQ tests, Jews and Italians were deemed intellectually inferior to Anglo-Saxon whites. Prof. Loury won't convince anyone who has previously dealt with Scalia's stubbornly essentialist and annoyingly presumptuous remarks that his motives are either pure or objective on subjects that concern historically sensitive issues of social justice and inequality. Whatever one thinks about Scalia's opinion in Heller (and assuming it has some relevance here), the statement that he relies on anecdote and "based his [Heller] opinion on one 19th-century casebook" is mistaken. I skimmed back through his [majority] opinion, counting the 18th and 19th-century treatises, dictionaries, statutes, constitutions, etc. he based his opinion on. I lost track and stopped counting at about 75 (not even counting court cases). The man (and the opinion) may have flaws, but thinly-researched superficial anecdotal analysis is not among them. As for Professor Loury, the Duke study he cites -- a data-intensive statistic-based analysis -- is the opposite of "anecdotal." Moreover, he offers the study as just an example of the broader literature on affirmative action "mismatch." As I posted earlier, the book "Mismatch" by Prof. Richard Sander is a great summary of this line of research (circa 2012). We shouldn't be surprised that Prof. Arcidiacono (one of the 3 Duke study authors) is an opponent of affirmative action. Prof. Sander is, too, though -- very tellingly -- he is otherwise liberal, and was a community organizer and an affirmative action supporter until his personal involvement with preferred admissions and his "mismatch" research convinced him that racial preferences are hurting the people they are supposed to help. A rational person can hold that these post-admissions racial performance differences are small. Or, that whatever their magnitude, they are of little practical significance post-graduation. Or, that whatever their practical significance, the benefits deriving from greater racial diversity in colleges due to affirmative action are such as to warrant accepting those racial performance disparities as an unavoidable cost of social progress. But, one cannot rationally hold at the same time that: (a) affirmative action is absolutely essential to avoid the exclusion of blacks from elite campuses; and (b) anyone who calls attention to possible consequences of such racial disparity in the academic qualifications of the students who attend said colleges must be dismissed as a "racist." Those foisting this position on the American people at this moment would have their cake — a goal of, say, 8% blacks in the student body of a college that accepts only 1 out of 15 applicants, and eat it too — enforcing a ban on discussion and exploration of the full implications of pursuing and achieving that goal. Prof. Loury - I hope you get this message out. This should be a NYTimes op-ed. The misinterpretations of Scalia' words at 'mismatch' may be intentional. Just as likely, they reveal that his critics haven't bothered to learn enough about affirmative action to recognize and understand the basic issues and arguments when they are raised. Scalia has been excoriated for mentioning (perhaps clumsily) one of the most important questions in the racial preference debate: "In the long term and on average, are racial preferences helpful for their intended beneficiaries?" As I'm sure Prof Loury knows, the book, "Mismatch" by Professor Richard Sander explores the research on the topic. The conclusion is an awkward one for those who have fought so hard for this type of affirmative action. Because so many seem unfamiliar with the mismatch concern Scalia alluded to, here's the simplest outline: Racial preferences - almost by definition - systematically put many minority students into schools or programs for which they are marginally or ill-qualified. Students who are in situations for which they are marginally or ill-qualified predictably usually fail to thrive there, and, critically, they tend to do worse in the long term than they would have had they been in a less-competitive program (i.e. a program to which they could have been admitted without racial preferences, and in which the student's qualifications would be more typical) where they could do well. Thus, the affirmative action programs do a disservice to their presumed beneficiaries and result in us having, overall, fewer successful minority graduates. I found the accusations of racism directed at Justice Scalia to be more than a little hysterical. He was making a point that can be empirically observed. What troubled me about Scalia's remark is that it seems to be an argument against any type of affirmative action. After all, if we were to replace race based AA with other proxies for disadvantage like parental educational attainment, geographical diversity, parental income, the resources available in your community, etc., we would likely have the same problems. Poor white students from underfunded schools would likely struggle to remain enrolled in STEM fields, you would still have a "mis-match." I still do not think this is a compelling reason to stop using affirmative action entirely. Such a system would likely make social mobility considerably harder for Americans from underserved communities. The first question is how much lower should the threshold be for admitting people for race or economic based AA? It probably shouldn't be so low that colleges are admitting people who can't be successful. But colleges can also modify existing programs to accomodate individuals from less fortunate backgrounds. My university invited students from disadvantaged backgrounds to attend intensive math and writing summer programs before classes began in the fall. I also think that we should encourage experimentation with transfer programs. Elite universities have exceptionally few spaces available to transfer students. This is unfortunate because many highly qualified poor students won't ever apply to elite schools. Perhaps we might see better outcomes if students who would have otherwise been admitted under some type of affirmative action scheme (or wouldn't have applied) would instead matriculate as a transfer student, either through a guaranteed transfer program or apply after a year at a less demanding school. I wonder if a student who came from an underfunded public school in upstate New York would have better outcomes if they did a year first at SUNY Albany or City College before going to Johns Hopkins. This brings to mind an important question regarding admissions decisions on "disadvantaged" students. Ideally, what we're doing is discovering potentially-overlooked potential. Imagine a college looks at Student A, from a terrible high school who nonetheless got a 720 on his math SAT, and decides to admit him in lieu of (or alongside) Student B, who attended a great high school (in a great neighborhood....) with lots of advantages and still got "just" a 740 in math. You can call this affirmative action, but it's more likely a decision that the Student A has more potential as Student B and will probably do better. Discovering such potential for success is what the admission decision was supposed to be about, and the school likely has empirical bases and experience for their confidence in Student A's abilities. The key is that there is good reason to assume that Student A will do better than his test scores (or GPA) by themselves would lead you to predict. That's not what racial affirmative action is about. The logic of racial affirmative action is not based on (and does not depend on) confidence that the preferentially-admitted student will do better than the one who is being rejected to make the space available. As Sanders' book shows, when students with poor qualifications are admitted solely based on their race, they perform generally in line with what their incoming qualifications (like GPAs and test scores) would predict. Jeff, totally agree with the point on overlooked potential. Obviously, the student scoring a 720 who grew up near Cabrini-Green is more impressive and probably more likely to succeed than the student who got a 740 and grew up in Winnetka. This is not the point Scalia was making because these two candidates have relatively similar credentials despite one being far more advantaged than the other. According to the Espenshade-Chung study, which measured how much of a bump underrepresented minorities get in terms of admissions preferences, they found that admissions committees on average give African American applicants a bonus of 230 points on the SAT (1600 point scale), Hispanics receiving 180, Asians facing a 50 point disadvantage. So we are no longer talking about small differences. Scalia's point was that when we admit someone from a disadvantaged group with below average credentials, they're mismatched into a school that does not match their skill level. But even in a system of affirmative action that is based on socio-economic status regardless of race (as I would prefer), you would still have the same problem; i.e. if you gave an average of a 230 point bonus to a disadvantaged white applicant. But I don't find this argument compelling. Perhaps we shouldn't be giving anyone as much of a "bonus" as we are currently, but I don't think that colleges should move in the totally other direction as Scalia seems to be proposing and be hamstrung into relying exclusively on grades and test scores to determine admission because they're excessively concerned about mismatching applicants with colleges above their skill level. Yes, the extent of the preferences (230 points) is much larger than most people realize. That's more than a full standard deviation. The "Mismatch" argument is that it's almost impossible to compete if you've been dropped into a group that is that much more qualified than you are. No one (not Scalia anyway) argues that admissions must be based solely on test scores. Lots of factors are considered (activities, leadership, etc. ), and sometimes folks with near perfect scores and grades are rejected. That's fine. The only objection is to basing those decisions on the Constitutionally dicey basis of race. When decisions are made based on race, there must be a very compelling rationale to survive Constitutional scrutiny, and the "mismatch" question may indicate that the traditionally presumed rationale isn't compelling at all. Cornell actually has just such a program in place. The state-funded schools of Cornell (which is private for Arts and Sciences, but land grant for the other undergrad colleges) reserve a set number of spots in each class for transfer students from New York State community colleges who are able to make a GPA cutoff. The community colleges are able to give underprivileged students better preparatory coursework than their high schools could, while helping them acquire the meta-skills necessary for success in college - time management and cultural literacy chief among them. Wouldn't it be interesting if more elite universities had blanket transfer acceptance policies in a similar way? I actually had the Cornell program in mind when I made that comment. I think the federal government can provide incentives for elite universities to open similar opportunities. I think this reply, and Katherine Howe's above, is a pretty insightful response to a legitimate point made by Glenn Loury. No, I don't think Scalia's remark was racist. It does raise an issue that needs to be addressed, but it doesn't amount to an argument against affirmative action of all kinds. In particular, if universities aim at diversity, they should devote the resources to support the people who fulfill that aim for them. And Glenn may be right (though I wouldn't quite put it in his terms): too often there isn't a consistent or concerted attempt to support students who aren't as well prepared for elite universities. But to fail to do this would amount to exploiting the very people who have been unfairly disadvantaged in the first place. The problem with Justice Scalia's remarks specifically and with the whole "mismatch theory" generally is an oddly misplaced emphasis on the evidence as it pertains to minorities. I say "misplaced emphasis" because such reliance does not seem to be universally applied to all cases - or all races. Justice Scalia's words at face value might not seem racist, though perhaps heard in their broader context they might. The University of Texas is required by law to admit all Texas high school graduates who graduate in the top 10% of their classes. In 2008, Abigail Fisher, who became the plaintiff in the case, applied to University of Texas, but was not automatically admitted because she was not in the top 10% of her graduating class. As a result, the University of Texas accepted all "top 10%'ers" that applied and then moved on to the remaining applicant pool, one of whom was Ms. Fisher. At this point, the University of Texas had a policy which it instituted some years ago that allowed race to be considered as one factor when choosing from this secondary pool of applicants. Notably, the University of Texas does not use race to automatically grant admissions. When Ms. Fisher's application was rejected, she claimed that here 14th Amendment rights were violated because considering race as a factor did not afford her equal protection. So, the question before the Court was whether or not the Court's interpretation of Equal Protection Clause of the 14th Amendment permits the consideration of race in the acceptance or rejection of undergrad admissions. In this light, Justice Scalia's sounds suspiciously concerned with the capabilities of racial minorities rather than the protection of the rights of the white plaintiff. As further evidence, he wrote a concurring opinion that was also slightly off point - and more about governmental discrimination - but then joined the majority opinion - which was more on point. Furthermore, Justice Scalia seemed overly concerned with how allowing "less qualified" racial minority candidates into the University of Texas, while ignoring the fact that the plaintiff herself was equally NOT qualified! She was in a pool of people who were not in the top 10% of their graduating class. Where was the concern as to whether or not the University of Texas would be doing her a disservice in admitting her rather than sending her packing to a slower-track school? Overall, Justice Scalia seems concerned to the point of distraction with "blacks" rather than the question at hand and it is this distraction that opens him to accusations of racism rather than just his words. I think this is a great point and yet a subtle one. There is almost no public conversation when it comes to AA about the relative qualifications of the white plaintiffs who belief their rights are being violated. In almost all AA cases, white students are claiming that without AA they would have been accepted into the school of their choice. Somehow, this reasoning is accepted at face value. Why is that? How many can even imagine a black student making the claim that they were not accepted to a school because a white student took a place to which they were entitled. I use “entitled” deliberately because at it’s core anti-AA evinces the old segregationist rationale that in order for blacks to ascend, whites must plummet. Anti-AA, therefore, is not really about equal-protection but about protecting white-entitlement. Obviously, the Supreme Court of the United States isn't actually especially concerned with Ms. Fisher per se. She applied to UT years ago and has (surely) gone on to college somewhere else, so this is no longer really about her. The Constitutional, legal and moral question whether racial preferences are proper in public university admissions does not depend in any sensible way on the personal traits of a specific redheaded girl from south Texas, so scrutinizing Fisher herself is just an effort to avoid addressing the issue. No one even disputes that some whites with superior credentials are rejected in favor of some minorities with lesser credentials. That's the very definition of affirmative action, and if a universities were not doing that, there would be no controversy. Shifting the dialogue to ask the factual question whether Fisher herself was one of those rejected for this reason is a sensible legal maneuver for the defense, but it is a tactic specifically designed to avoid addressing the true merits of the larger issue. Imagine that in Brown v. Board of Education, you discovered at the last minute that the Brown family residence might be just outside the school district border. Or in Obergefell (gay marriage), should the court have scrutinized whether Mr. Obergefell might have broken up with his fiance and might not actually go through with the wedding? Answering our national affirmative action debate by squabbling about (or attacking) facts peculiar to Ms. Fisher misses the point just as badly. The point being made by bringing up her qualifications is that Justice Scalia's remarks - and the mismatch theory studies - seem to focus heavily on African Americans and how UT would have been doing them justice by sending them to a slower-track school, but glosses over the fact that the same reasoning applies to Ms. Fisher. My criticism is not directed toward Ms. Fisher, it is directed toward an unevenly applied standard. If one is to question whether AA does a disservice to African Americans by placing them in to challenging schools (when they're not in the top 10% of their graduating class) then the same question could be asked of ANYONE who does not graduate in the top 10% of their class, unless of course you think that African Americans - as compared to other "unqualified" candidates - are inherently more "unqualified" than other "unqualified" candidates. My point is not to prove that Justice Scalia is racist or just prejudiced - but rather to show how his words and actions in that context have opened him to those charges. There's a critical difference between UT's racial preferences and the other decisions to admit students whose GPA falls outside the top 10% of their high school class. Many or most students (of any race) admitted in that situation are accepted precisely because they have other clear indicia -- most notably SAT or ACT scores -- that give strong evidence that they will be successful and have a positive, beneficial experience. This tends to lead to happy outcomes. But when a decision is instead made because of the student's race, in absence of high test scores or other reasons to believe the student will succeed, there's no basis to predict that the student will fare well. Bringing the student into an environment with no reason to believe they will fare well sets the student up for failure, and the empirical evidence is that they do poorly. The well-intentioned system hurts the very person it purports to help. Thomas, I think I only used the word "attack" with respect to "facts" (not a person). The point was that challenging and squabbling over particular facts about a particular person (e.g., "Would she have been admitted otherwise") misses the larger points -- not that anyone was attacking Ms. Fisher. I think we've spent far too much time fixating on this mismatch conversation. So what if the current findings suggest that African Americans are less likely to matriculate to science majors. There are many reasons and possible solutions. First reason: high school preparation. Second reason: cognitive bias during college itself. First reason: Any student coming from a non-elite high school is not prepared for elite university science classes. A personal example that has nothing to do with race or class. I took my over-privileged white daughter out of the "gifted" track after elementary school (goodness knows why we have such tracking in elementary school) and sent her to a public magnet which was writing intensive and integrated into a children's museum. Great middle school. But without the science labs 8th and 9th graders usually have access too. When she returned to her "gifted" AP classes in high school, she could never get back into the advanced science tracks, she did not have the background. When she got to college and took a physics for non-majors course, she loved it. She investigated changing majors but it would have taken her an extra year to graduate, and that just doesn't happen at the elite women's college she attended. A philosophy major it was. Still a great education. Still the same alumni networks. Any student who comes from a disadvantaged background will be behind thru no fault of their own. And will benefit from the social network that accompanies an elite campus. Second: there is a great deal of evidence that there is on-going cognitive bias which effects performance of both women and minorities, in science classrooms and elsewhere. This mismatch conversation doesn't deal with either of these issues. To reduce the continuing disadvantage of women in science, and African Americans on campus, we have to use affirmative action to overcome bias in preparation and cognitive bias in science... will post my own comment on that soon. I happen to be reading Nicholas Lemann's The Big Test right now and so, yes, I found the accusation against Scalia ill-informed and alarming. And, indeed, it very much stops the conversation that needs to take place regarding how to prepare and support students, especially highly capable students who merely haven't had the advantages that other students have had. Just a shout out, however, for a related matter. The Duke study was misinterpreted. I read the Duke study. It, like most academic studies, could've been written in a far more transparent, coherent manner that would leave very little room for misinterpretation. People who are researching matters of great significance to society should communicate as if society is really reading their studies. That's what we should dream of happening...that society -- not just other academics --read, understand and use good research. Victoria - The Big Test is a great book! I wish more people would read it. I hope you're reading it for purposes of some writing project. The tests (like the SAT) Conant pioneered have completely transformed higher education the whole concept of "elite" universities. As a rural Oklahoma boy who wound up at Harvard Law School (thanks to the ACT, SAT and LSAT), Lemann's book made me realize how Conant had profoundly changed my life. It's an ironic shame that tests like the SAT are now wrongly viewed (and demonized) as barriers to equal opportunity and social mobility. If you haven't seen it, "The Chosen" by Jerome Karabel offers a different take on similar subject matter. All the comments are about the merits of what Scalia asked about and whether it was racist. It may well be that Scalia had a personal opinion when the questions are looked at in the context of all his other opinions and speeches, but I'm not sure from this oral argument. Scalia believed in the adversarial process. There was an article in the NY Times today penned by one of his ex-clerks, who is now a state Supreme Court judge. She says he liked the devil's advocacy played out in his chambers. We shouldn't assume too much when an appellate judge asks a question. S/he may be testing the strength of an idea. As a lawyer, I am no fan of Scalia's, but I think we are making a whole lot of assumptions here.